If you're in Long Island, hope to see you there! Motor City Comic Con This Weekend! I'm heading back to my homeland in Michigan for Motor City Comic Con this Fri 5/18 - Sun 5/20! If you're around southeastern MI, check it out - XENA's going to be there! She has a panel at 2p on Sunday. Also I'm table H-6 in Artist Alley. If you stop by my table you'll get to see my newest comic, Other Realms! Also doing sketches as usual. Another panel that looks good is Promoting your Comic Books Through Podcasts at 4p Fri. Tickets start at $25 and up. Also get there early, especially for Saturday, as traffic gets really bad in the afternoon. It's always great to exhibit at Motor City - I went to that convention as a kid and it's really changed and gotten way bigger and better! Hope to see you there! Class Now Only $50 for Business Basics for Freelancers! The class is at Anyone Comics in Crown Heights: 1216 Union St, Brooklyn, NY 11225. It's from 6p-9p. The closest subway is the President St. 2/5. We'll also go over stuff like banking, taxes, and one of my favorite subjects - productivity! No matter if you've been freelancing for awhile or are considering taking the plunge from your day job, there are always new things to learn. Please spread the word as well, and hope to see you there! Next Business Basics For Freelancers Class! If you missed my last Business Basics for Freelancers class, I'm having another one in 2 weeks on Wednesday May 9, from 6p-9p! With the arrival of spring, we tend to find the energy to get out there and DO things we've been putting off all winter. Now's a great time to sharpen your business skills to become a more successful freelancer! This time, the class will be at Anyone Comics in Crown Heights, Brooklyn (1216 Union St). They have a very nice downstairs area where they've held lots of fun events I've been to before (and they have not only one, but TWO bathrooms! I'm probably the only one who gets excited about the bathrooms, but really... it's LUXURIOUS for NYC & you'll be comfortable being in the class for 3 hours). This class is open to ALL freelancers, from musicians to painters to event planners & more. And PLEASE spread the word! Even if you think the class isn't for you, do you know someone it WOULD be good for? The more I talk with other freelancers, the more I realize just how much the topics I cover (keeping track of projects, banking, taxes, productivity) are needed in our communities. Hope to see you and some of your friends there! OTHER REALMS Debuting at BIG APPLE This Weekend! EXCITING ANNOUNCEMENT! I'm debuting a brand new officially printed (like an actual comic - not from Staples!) called "OTHER REALMS" at Big Apple Con this weekend! I've been working with writer Patrick McEvoy for awhile on short stories for the past year or 2, and now we have enough material for a book! Inside, you can jump to 8 other realms where technology has unexpected consequences! It's a sci-fi 'zine of short stories, printed in comic book format, but features a mix of comic art with prose/poetry + illustrations. The flyer pretty much says it all! Tickets are $25 per day. 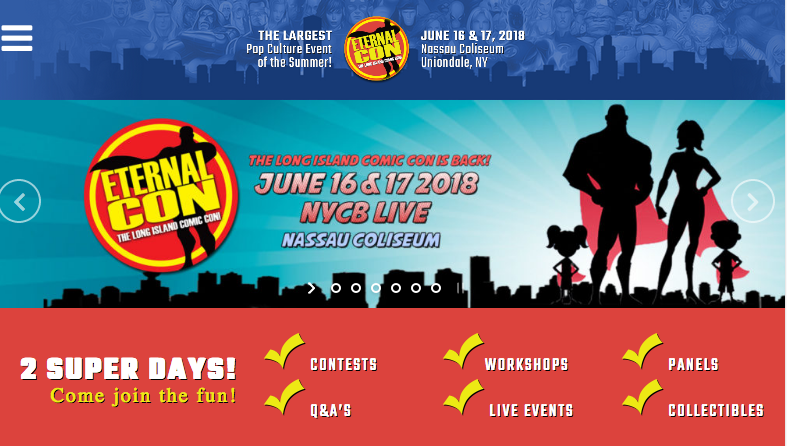 If you think NYCC is too expensive, this is your chance to attend a comic con for a better price and get a feel of an "old school" convention. In their own words: "Low ticket prices and family-friendly fun is the lure of this classic style convention that brings together fans of all kinds of entertainment from all walks of life. Through the central theme of comic books, the convention features a large range of pop culture elements including science fiction/fantasy, film/television, cosplay, animation, anime, manga, toys, horror, collectible card games, video games, web comics, and fantasy novels. Including panels with celebrity and artist guests, the Big Apple Comic Con also features an amazing Artist Alley with the best local talent, and two main event Costume Contests, one each day!" Comic cons are GREAT for deadlines to publish new work, and debuting OTHER REALMS at Big Apple is a prime example. Even though ideally we wanted to debut it at MoCCA Fest, it couldn't get shipped in time. However, I was able to make some postcards for it to give away at MoCCA to create some buzz. Look for opportunities even in possible setbacks! Hope to see you at Big Apple! at Metropolitan West 639 W 46th st.
We're at table E174 on the first floor near the Wacom booth. Tickets are just $7 per day! I was just emailing someone today about some differences between MoCCA Fest and other comic cons. It's an indie comics festival, so you'll see lots of self-published comics focusing on personal stories, rather than a more hard-core comic con with Marvel/DC stuff. But there's something fun for everyone at MoCCA Fest! There's a Wacom booth where you can try the latest tablet gadgets, Patreon Lounge where you can learn about all the awesome stuff Patreon does (and if you're a freelancer, you SHOULD know about Patreon), and a RisoLab. There are panelists who will talk about issues like "Comics, Community and Career", and everything from the New Yorker comics to experimental comics. Hope to see you there! Business Basics for Freelancers THIS SATURDAY! I have mixed memories of college - on the one hand, art school was very difficult and stressful, but on the other hand, I got to try some amazing things I may have never attempted if professors didn't push me. Sometimes I think about how productive I was in college, and it's hard to keep that kind of momentum going for personal projects long after graduating. In my art submission to the exhibit "Future Former" at the University of Michigan Stamps School of Art & Design, I photographed some progress I've made on my comic series "AER HEAD," and wrote about my struggles with completing this enormous personal project. More about the exhibition, from the Stamps School site: "Future Former: An Exhibition of Alumni Work honors the creative work and careers of all Stamps School alumni, creates an aspirational connection between generations of U-M artists and designers and current Stamps students, and inspires reflection during the university's Bicentennial year. Funds raised through this exhibition will support new studios and collaborative spaces at Stamps. Curated by Stamps Professor Franc Nunoo-Quarcoo with alumna Emily Schumer (BFA 2017), Future Former will be on view Monday, January 8-Friday, February 9, 2018 on the first floor of the Art and Architecture Building 2000 Bonisteel Blvd, Ann Arbor, MI 48109. Join us for an artist panel and exhibition reception on Monday, January 29 from 5 - 6:30pm. The artist panel, moderated by John Luther, Career Development Coordinator, includes Janna Coumoundouros (BFA 1998), Nawal Motawi (BFA 1988), Robin Wilt (BFA 1971), and Matthew Zivich (BSDes 1960)." I'm sure all the art is phenomenal, but I'd encourage anyone to go this Monday just to see the moderator, John Luther! I probably wouldn't be living and working in NYC now if it wasn't for his encouragement. Among helping me with many other struggles of college stresses, I remember he first planted that little seed of "what if" I moved to NYC. I was scared at first, because I'd never been there. But here I am! And have been for 7+ years, making it as an artist! Now that I'm teaching cartooning myself, I hope that some encouragement seeds grow for my students. You never know what will stick with someone or be life changing. Business Basics for Freelancers Class! Happy New Year! Are some of your 2018 resolutions to make more money, become more successful at freelancing, or get more organized in your business? If those goals sound good to you, please sign up for my new class at Shoestring Studio! Often, we’re artists first and business people second, and sometimes the business side of art can seem overwhelming to us. I’ll break down some “scary” concepts into bite-sized steps you’ll work on during the class. We’ll cover everything from making a product and pricing it to how to get more freelance work by exhibiting. We’ll also talk about the “not-so-fun” but very important aspects of keeping track of your earnings, banking, and taxes. We’ll also touch upon contracts and time management. All in 3 hours – WHEW! Probably the biggest question on everyone's mind is how Trump's new tax laws will affect you. This class is on February 24th, well before taxes are due mid April, so you'll have time to sort it all out. Take deep breaths - we'll get through it together! Although I'm not a "tax professional," I have one, and will share what I've learned from them and point you in the right direction. Really, the whole class is me presenting you with information that I've learned through trial and error, but what you DO with that info is entirely up to you. I'll provide you with work sheets so you can start taking concrete steps on topics immediately. It's $75, which is cheaper than other Shoestring classes, but in the bigger picture, you'll be saving money in the long run with the knowledge you'll gain. Feel free to email me any questions about the class at [ mindy at mindyindy dot com ]. Very excited for the class! Meanwhile, what are your other new year's resolutions? My theme for 2018 is to "simplify my life," starting with lots of decluttering and cleaning in January! Shoestring Studio Holiday Bizarre this Sunday! This Sunday I'm exhibiting in a small indie artist show, held at Shoestring Studio in Brooklyn! Shoestring is a wonderful resource for artists of all kinds from printmakers to cartoonists. It's a membership-based art studio but they have lots of events that are great for connecting with the artist community. They have classes going on there too, and I'll be teaching a comics business one in January! (more on that later) I first heard about them by going to Brooklyn Draw Jam one time - it's a monthly event where artists sit around a table and work on collaborative comics. If you're in the Brooklyn area, bring the whole family to the Brooklyn Friends’ annual holiday market and kids fair! A great place to get holiday gifts and just have a great time - there's so much going on at the fair! I'll be tabling with Nadia Burgess of ToughSpirit Creations in the Holiday Market section, and they also have tons of fun stuff for kids like a bouncy house, face painting, and craft-making. Fun for all includes live music and karaoke. They have a bake sale, book sale, and plant sale too (like poinsettias). It's totally FREE to attend! Saturday, December 2, 2017 from 11am to 4pm at 375 Pearl Street in downtown Brooklyn. Closest subway stations are Jay St. Metrotech (A,C,F, N,R,W) and Borough Hall (2,3,4,5). If you're in the NYC area, please spend an evening checking out what some local women artists are up to! I'm in the art expo part of the show with almost 30 other women, and there is live music and film too! Your $15 admission goes to helping end child trafficking through Freedom Ladder. Please come and invite others you think may be interested! Even though I do a lot of larger comic cons, it's really nice to do a variety of smaller local shows too. Hope to see you there! Note that Artist Alley is in a different location this year! We're on Level 1, which is the underground level - take the escalators downstairs. This is different than in previous years when we were off in a separate annex. Fingers crossed we'll all still get reception down there. In the map below, we're the first blue rectangle on the left. See a more detailed map here. It's nice that NYCC has a space to put info about us artists online. Super excited and hope to see you there! Thursday tickets to NYCC are still available as of this posting! 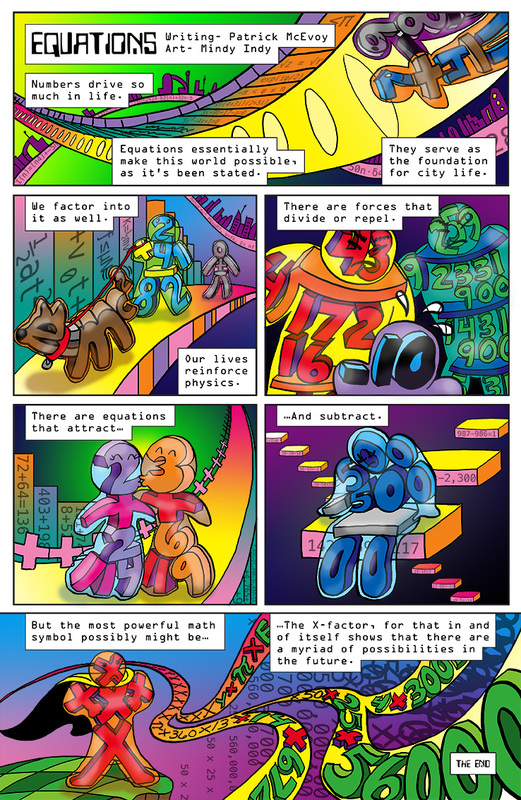 I'm happy to present to you the latest comic I worked on with writer Patrick McEvoy, called "Equations!" This one was tricky to draw, since the characters are made up of numbers/equations, and I'm used to drawing humans, but I was up for the challenge. Went through some character designs before we came to the final result. I was thinking of numbers stacked on each other like School House Rock-style, and in the end we decided to have human-like bubble-forms around the figures too. In other news, NYCC is next week! I'm still on the wait-list for an artist alley table, but if that changes, I'll blog about it. I am doing pre-show commissions though! I'll be there at the convention as a "professional" for all 4 days, networking and checking out creator panels. 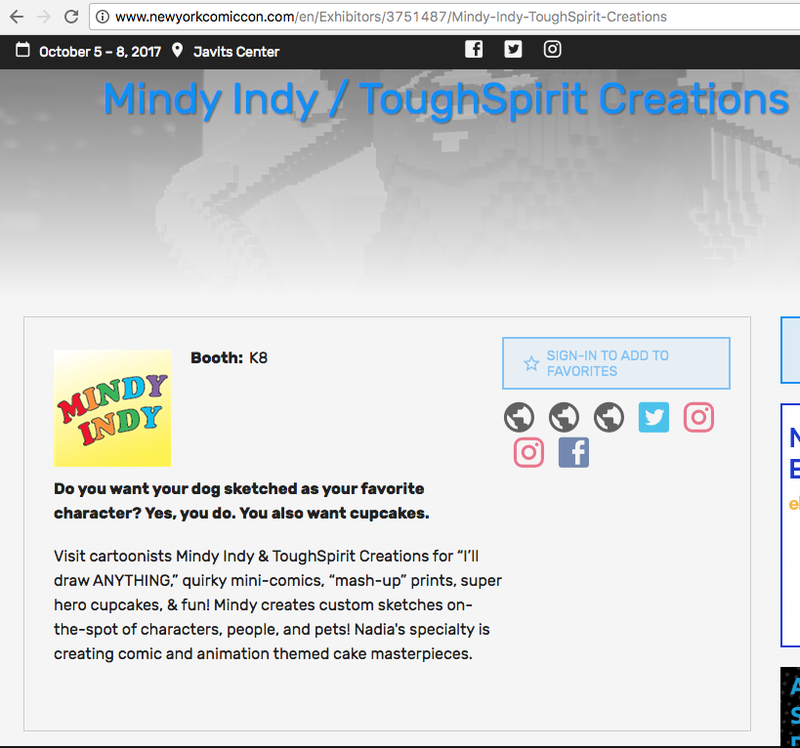 If you'd like to get a custom sketch from me, please email me at mindy@mindyindy.com BEFORE the show and tell me what you'd like. You can PayPal to that address, and we can meet any day at the show for you to pick it up! Also, if you'd like to get a variant sketch cover comic at the show and have me draw on it, send me an email and we can connect at the show (I won't be checking email during show hours though, but give me a head's up if you're thinking of variants). Thanks and looking forward to a super fun show! Baltimore Comic Con This Weekend! If you're in the Baltimore/DC area, hope to see you there! The most important thing you need to know about Boston Comic Con is that it's in a new place this year - kind of near the old place, so you won't get totally lost, but it's at the Boston Convention & Exhibition Center instead of the Seaport WTC. A few blocks south from the seaport at 415 Summer St. I'm sharing a table once again with my friend Jennie Wood in Artist's Alley #AA300. BCC is also run by a new company this year - Fan Expo - so we'll see what new changes are in store. I think that the convention will be bigger, as this is a larger building. Once again I'm blogging last-minute. OK now to catch some Z's before waking at 5:45AM. If you're in the Boston area, hope to see you there! sorry for brevity, posting from my iPad!